At Bean Bags R Us, we understand how quality products can enhance your life. Our line of top-quality polyester bean bags is superior to all of its peers on the market, and now we’re proud to introduce our newest line of luxury bean bags made from sumptuous materials that take comfort and extravagance to new levels. If you’ve ever relaxed in one of our bean bag chairs or loungers, you already know how blissfully soft and comfy life can be. Imagine the same incredible fluffiness covered with the most beautiful natural materials in the world. 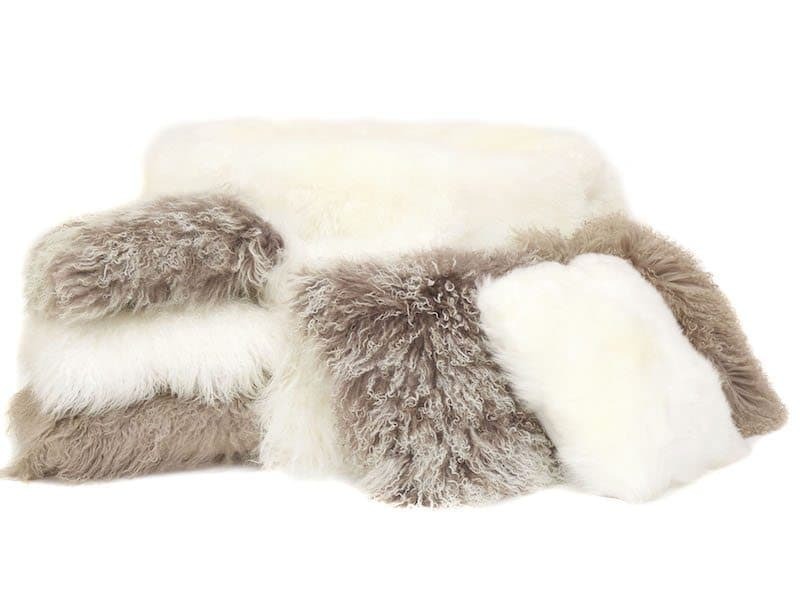 Pure Australian lambswool or sheepskin is a remarkable product that boasts both delicious, indulgent softness and surprisingly practical benefits. The same lambswool that pampers and protects your skin is also naturally resistant to flame and static electricity. Long, silky and slightly wavy pelts cover our Tibetan wool products; they’ll entice you with their uniquely cuddly texture and add dazzle to your decor with their lavish, upscale appearance. Our new range features both neutral and trendy decorator colours that can be mixed, matched or singled out to add unusual interior design elements to living rooms, dens, bedrooms and more. The new range of lambswool and Tibetan wool luxury bean bags features a variety of goods to provide both function and visual allure. Here are a few highlights from our collection. A classic, casual bean bag surrounded in whisper-soft natural lambswool; this seat will be the most popular one in your home. Enjoy the freedom of resting your body in a chair where the pressure points and awkward positions are not even possible. Versatile, lightweight and portable, your lambswool bean bag can follow you to your favorite hang-out spots or make itself the fluffy focal point of your most formal room. It will get plenty of attention when your guests see it and even more when they sit in it. Our new sheepskin beanbag chair is available in teal, ivory and steel grey. Comfort is even more complete when you can rest your feet. Covered in the same sumptuous lambswool, the square ottoman is a perfect partner for our new luxury bean bag. Use it to give your tired feet a lift or hold your magazines while you enjoy your leisure time. The stylish cube of fluff is available in colors that match our lambswool bean bag chair and works well with any decor. No decor is complete without a stunning accent piece. Our square lambswool cushion makes an elegant statement when placed on a sofa, chair or bed. Its rich texture is noticeable from across the room, and a close-up encounter will prove that it’s impossible to pass by the enchanting pillow without touching it. Let it sit in quiet beauty with your solid color or printed upholstery as a background, and cuddle it mercilessly when no one is looking. Throws are immensely popular additions to living spaces because of their many practical uses and their ability to add color and style. Our Tibetan wool throw is guaranteed to outshine any other that you’ve ever owned. Snuggle under its natural, wavy pile on movie nights, or let it soothe your body and coddle you back to health when you’re tired or ill. Toss it casually at the end of your couch or chair to fully display its unmatched natural beauty. Our throw is available in dune or ivory. Indulge yourself with the softest most luxurious textiles available. These ultra-soft pure Tibetan wool scatter cushions will warm up even the coolest spaces in your home. Available in three yummy colours to compliment any couch or sofa. The Australian winter is just around the corner, and our cozy luxury range is perfect for keeping you warm on even the coldest nights. Snuggle into your winter routine with a plush bean bag and a fluffy pillow, and engulf yourself in the warmth of our Tibetan wool throw while you read or relax by the fire. Don’t worry; when warmer temperatures come back around, you won’t have to put them away. Lambswool products help your skin stay cool in summer too, so you can enjoy them year-round. Isn’t it time to give your stylish abode the most enviable furnishings on the planet? Our new lambswool and Tibetan wool luxury bean bags and accessories can give any room in your home an elegant and elite look and feel that rivals the most opulent living spaces you’ve ever seen, and their unbelievable comfort will make you feel like a pampered celebrity. To enjoy the best life has to offer, order yours today.